Dublin Western Front Association - 16 January, 1916/2016. Branch Meeting, 16 January, 2016. Died of Wounds, 16 January, 1916. John was born circa 1888, to Joseph and Elizabeth Hegarty of Donegal. 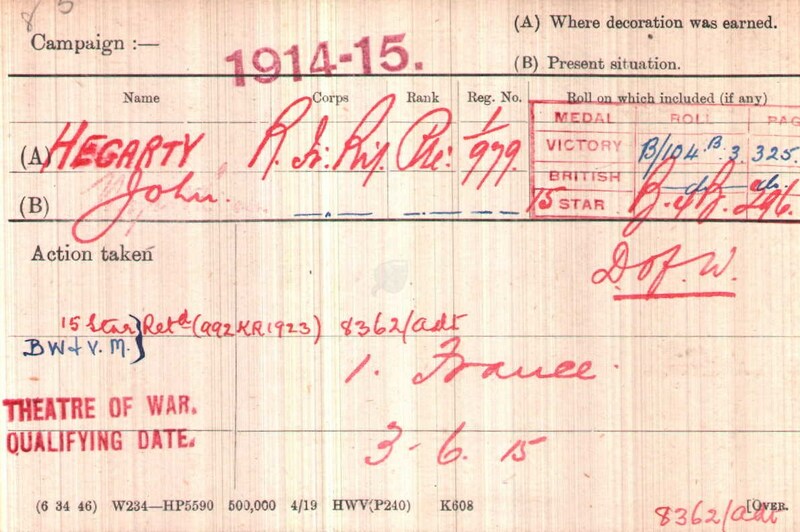 He landed in France on 3 June, 1915, and was entitled to the 1915 Star and the British War & Victory medals (1). He is buried in the Sailly-Sur-La-Lys Canadian Cemetery. He left a widow, Elizabeth, who lived at Back Street, Ballyshannon, Co. Donegal. 1. It would appear from the information on John?s Medal Index Card, that his medals were returned.